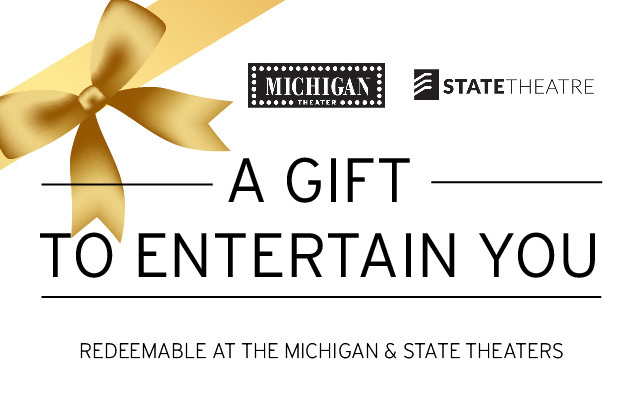 Give the gift of entertainment and cheer with a Michigan & State Theater e-gift certificate. The gift certificate has no expiration date and can be redeemed for any Michigan or State Theater-sponsored film tickets, as well as for concessions and merchandise items (*exclusions apply). Great for friends, parents, co-workers, and anyone who might just need a night away...who knows, they might just let you tag along! *excludes membership, concerts, private events, and any film not sponsored by the Michigan & State Theaters. Cannot be redeemed for cash or applied to prior purchases. Gift certificates purchased online are delivered electronically, as both a PDF and a mobile version. PDFs can be printed and gifted, or emailed to the recipient. Want to purchase a hard-copy gift card instead? Visit Guest Services in the Michigan Theater lobby during regular business hours.